Industrial water treatment requires different, specialized treatment programs to achieve optimum water conditions. Careful water analysis, monitoring and testing to continuously achieve these conditions is often crucial and may even be regulatory. 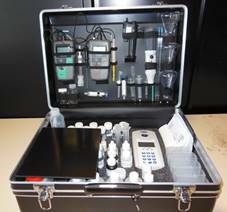 WCS specialise in supplying the industry with a wide range of water testing equipment. Application specific test kits are carefully compiled for many standard systems including, but not limited to: boilers; open evaporative cooling systems; closed cooling loops and heating systems. Alternatively, customers may chose from the many 100’s of tests available to construct multi-parameter test kits that best suit the individual testing regimes. Please contact WCS, and ask to speak to one of our water treatment specialists on how we can help you and your company save on costs whilst ensuring that you remain safe and compliant.